Words and images by ANDY CALLER. 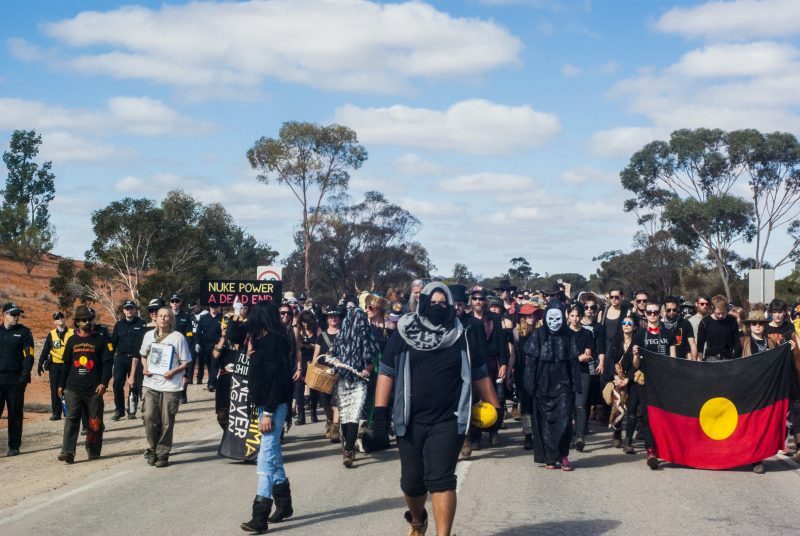 Roxby Downs Protestival – The Lizard Bites Back! 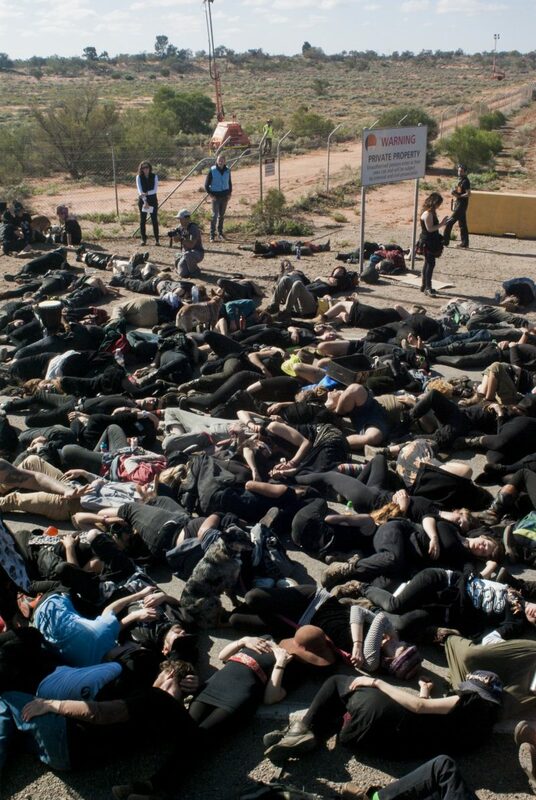 – saw activists use non-violent direct action to raise awareness of: the expansion of pre-existing mine at Roxby Downs, the significant impacts of the exposed waste in tailings dams (contaminated water containing radioactive material that is a by-product of mining), and the continued occupation of the First Nations people of Kokatha county and surrounds. 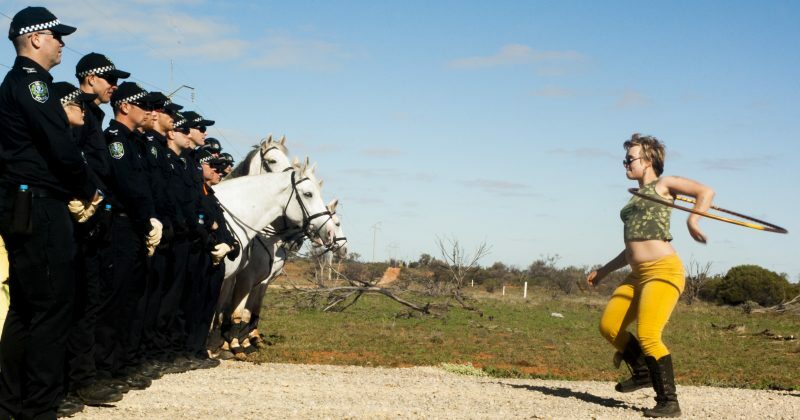 Willing to confront the mouth of the beast at the “gates of hell”, Olympic Dam uranium mine, the activists, environmentalists and concerned citizens present were not deterred by the threat of a high police presence – armed as they were with defection stickers, horses and a stone-cold resentment for being there. There has been criticism in response to the use of the non-violent direct actions at The Lizard Bites Back. Some have called out the aspects of white privilege present, with activists not taking into account of the use of mutated white babies as props, when it was not white children that were buried by their mothers after the fallout at Maralinga. Still, the bombs dropped there were remembered and named as a long list of global radioactive spills, disasters, plants & bomb tests was recited for the crowd, after which bodies collapsed in a die-in to commemorate the fallen. The high police presence was intrusive and blunt through the use of drones and stationary cameras on the camp and at the gate. Continuous patrols operated along the border of the camp, which doubled as the parameter of the exclusion zone in which police had enhanced powers of authority by application of anti-protest laws. In this zone, unprovoked searches are the norm, and a refusal to present identification would result in arrest. Although the police were relatively placid in their dealing with protesters, the use of a sacred fire as a road blockade on the third day caused an aggressive and frustrated response to the delivery of more firewood, as well as stretching the patience of the police and stretching the composition of the hardline regiment. Allegedly, questions of the validity of the force’s presence in such numbers caused infighting through the ranks of officers. 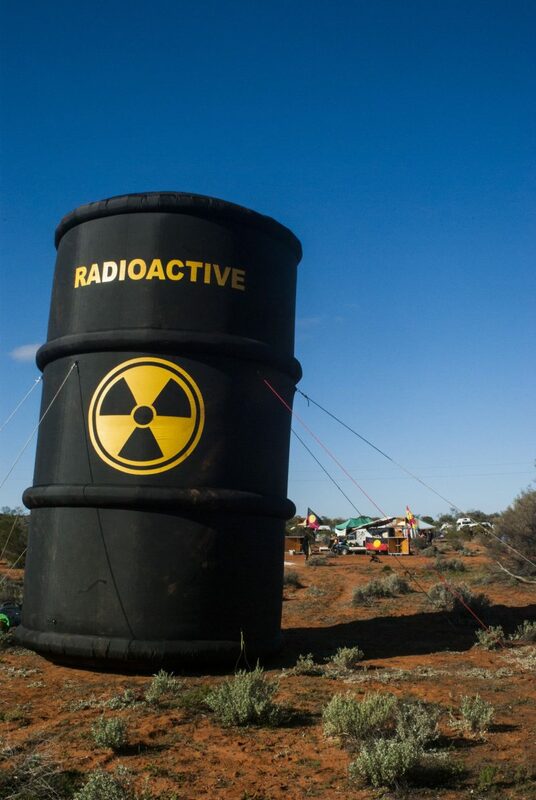 There was also an aim to raise awareness of the placement of 3 high-level radioactive waste dumps in South Australia, one of which is set to be positioned on the first thoroughly recorded Songline northwest of so-called Hawker. This is recognised as a significant cultural route of the Adnyamathanha People, and the site has been nominated without their consent. The other two proposed locations are bordering Pinkawillinie conservation park, posing a threat to the area’s unique biodiversity and likely impacting the economic contribution of the Flinders Ranges as a financial asset to South Australia’s tourism industry. (Between 2013-14, The Flinders Rangers contributed an estimated $281 million to the tourism industry in South Australia’s regional income). 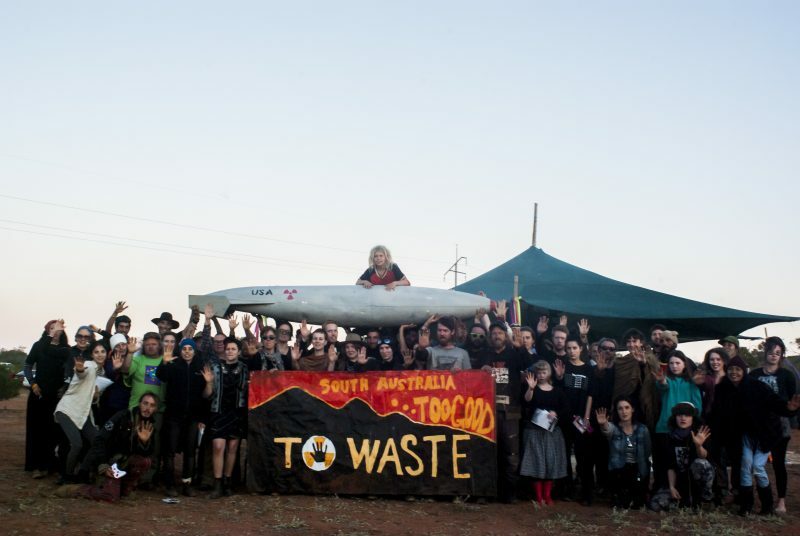 The news that South Australia may become a nuclear waste dump for the world comes despite a lack of consultation with First Nations elders and communities. It represents a spit in the face to the significance of land and connection to country that traditional owners maintain, and further depicts the continued reach of colonial dominance through economic forces. 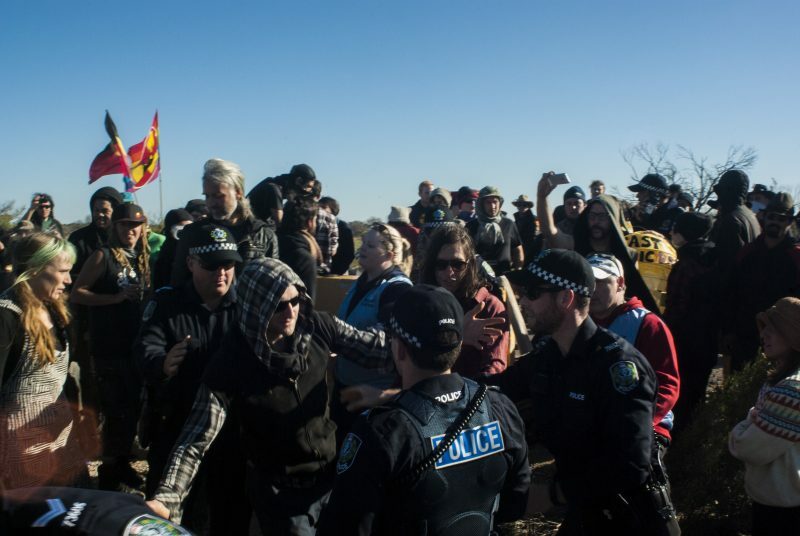 A workshop on the second day saw activists forming affinity groups around the country to raise awareness of the dump proposals, networking to establish a national resistance (pictured above). Together, we say: wanti, uranium, keep it in the ground.